"When Trojans had come to Europe, they separated into two ways. One of them was Francions, the predecessors of Franks and the other one was Turcoths, the predecessors of Turks. Franks had gone to Rhône area while others had stayed in Tisza area. 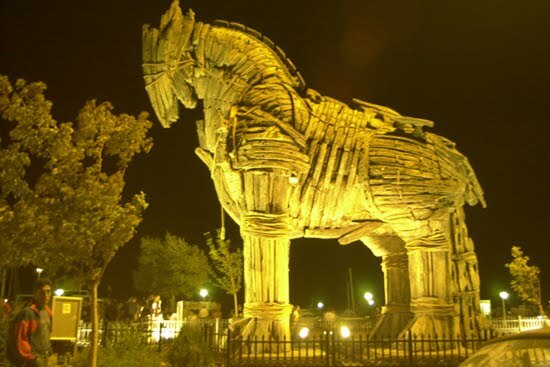 "After Troy has fallen, Trojan armies were separated by two groups. "Turci in Latin and Turchi in Italian, both, come from Teurci, which was formerly used to indicate the name the “Trojans” by Latin poem writer Vergilius. In Scandinavian languages, "Tyrkir" has two meanings: one of them is Turkish, the other is Trojan" Prof. Dr. Haluk Şahin - Turkish Reporter, Writer, Lecturer in University. “Trojans were the origin of Luvis who became later the roots of Hittites. Everybody knows they came from behind the Caucasian mountains. However, nobody knows where they went after their empire has fallen as nobody knows where the Trojans went..."